Thalassaemia is actually a group of inherited diseases of the blood that affect a person's ability to produce hemoglobin, resulting in anemia. Hemoglobin is iron containing protein in red blood cells that carries oxygen and nutrients to cells in the body. About 100,000 babies worldwide are born with severe forms of thalasseamia each year. Thalassaemia occurs most frequently in people of Italian, Greek, Middle Eastern, Southern Asian and African Ancestry. The two main types of thalasseamia are called "alpha" and "beta," depending on which part of an oxygen-carrying protein in the red blood cells is lacking. Both types of thalasseamia are inherited in the same manner. The disease is passed to children by parents who carry the mutated thalasseamia gene. A child who inherits one mutated gene is a carrier, which is sometimes called "thalasseamia trait." Most carriers lead completely normal, healthy lives. A child who inherits two thalasseamia trait genes - one from each parent - will have the disease. A child of two carriers has a 25 percent chance of receiving two trait genes and developing the disease, and a 50 percent chance of being a thalasseamia trait carrier. Most individuals with alpha thalasseamia have milder forms of the disease, with varying degrees of anemia. The most severe form of alpha thalasseamia, which affects mainly individuals of Southeast Asian, Chinese and Filipino ancestry, results in fetal or newborn death. It a type of blood disorder that results in anemia in an individual due to defective haemoglobin synthesis caused by alpha gene deletion on chromosome number 16.You need four genes (two from each parent) to make enough alpha globin protein chains. If one or more of the genes is missing, you'll have alpha thalasseamia trait or disease. This means that your body doesn't make enough alpha globin protein. If you're missing two genes, you have alpha thalasseamia trait (also called alpha thalasseamia minor). You may have mild anemia. If you're missing three genes, you likely have hemoglobin H disease (which a blood test can detect). This form of thalasseamia causes moderate to severe anemia and requires blood transfusions if haemoglobin is low. Very rarely, if a baby is missing all four genes. This condition is called alpha thalasseamia major or hydrops fetalis. Babies who have hydrops fetalis usually die before or shortly after birth. The picture shows one example of how alpha thalasseamia is inherited. The alpha globin genes are located on chromosome 16. A child inherits four alpha globin genes (two from each parent). In this example, the father is missing two alpha globin genes and the mother is missing one alpha globin gene. 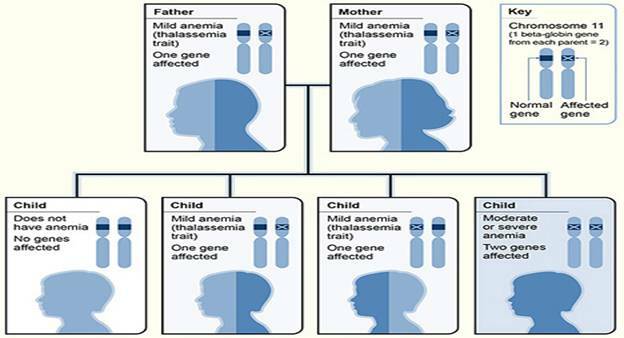 Each child has a 25 percent chance of inheriting two missing genes and two normal genes (thalasseamia trait), three missing genes and one normal gene (hemoglobin H disease), four normal genes (no anemia), or one missing gene and three normal genes (silent carrier). Beta thalasseamia is a blood disorder that reduces the production of hemoglobin and is caused by mutations in chromosome number 11. In people with beta thalasseamia, low levels of hemoglobin lead to a lack of oxygen in the body. Affected individuals also have a shortage of red blood cells (anemia), which can cause pale skin, weakness, fatigue, and more serious complications. People with beta thalasseamia are at an increased risk of developing abnormal blood clots inside body, are prone to infections, etc. Beta thalasseamia is classified into three types depending on the mutations in beta genes of haemoglobin: thalasseamia major (also known as Cooley's anemia), thalasseamia intermedia and thalasseamia minor. Of the three types, thalasseamia major is more severe. The signs and symptoms of thalasseamia major appear within the first 2 years of life most of the time when child is 6 months old. Children develop life-threatening anemia. They do not gain weight and grow at the expected rate (failure to thrive) and may develop yellowing of the skin and whites/scleras of the eyes (jaundice). Affected individuals may have an enlarged spleen, liver, and heart, and their bones may be misshapen. Some adolescents with thalasseamia major experience delayed puberty. Many people with thalasseamia major have such severe symptoms that they need frequent blood transfusions to replenish their red blood cell supply. Over time, an influx of iron-containing hemoglobin from chronic blood transfusions can lead to a buildup of iron in the body, resulting in liver, heart, and hormone problems. Thalassaemia intermedia is milder than thalasseamia major. The signs and symptoms of thalasseamia intermedia appear in early childhood or later in life. Affected individuals have mild to moderate anemia and may also have slow growth and bone abnormalities. These children require blood during stressful situations. Thalassaemia minor is causing no problem to the individual but is carrier of the disease and can transfer the disease to their offsprings.It is sometimes called carrier. How common is beta thalasseamia worldwide? Beta thalasseamia is a fairly common blood disorder worldwide. Thousands of infants with beta thalasseamia are born each year. Beta thalasseamia occurs most frequently in people from Mediterranean countries, North Africa, the Middle East, India, Central Asia, and Southeast Asia. Aprox. 1.5% of the world's population is carriers of β thalasseamia. The Southeast Asia Region accounts for about 50% of the world’s carriers.Prevalence of Beta Thalassemia major are 5-7% in Pakistan. How do people inherit beta thalasseamia? 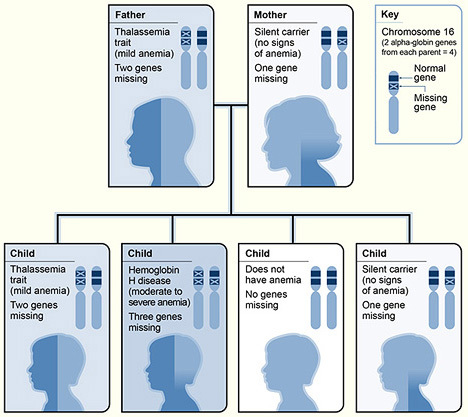 Inheritance of hemoglobin genes from parents with thalasseamia trait. As illustrated, the couple has one chance in four that a child will inherit two thalasseamia genes. The child would have a severe form of thalasseamia (thalasseamia major or thalasseamia intermedia). The severity varies, often significantly. The nature of the particular thalasseamia genes greatly influences the clinical course of the disorder. A lack of oxygen in the bloodstream causes the signs and symptoms of thalasseamia. The lack of oxygen occurs because the body doesn't make enough healthy red blood cells and hemoglobin. The severity of symptoms depends on the severity of the disorder. Alpha thalasseamia silent carriers generally have no signs or symptoms of the disorder. The lack of alpha globin protein is so minor that the body's hemoglobin works normally. People who have alpha or beta thalasseamia trait can have mild anemia. However, many people who have these types of thalasseamia have no signs or symptoms. Mild anemia can make you feel tired. Mild anemia caused by alpha thalasseamia trait might be mistaken for iron-deficiency anemia. Bone problems. Thalassaemia may cause bone marrow to expand. Bone marrow is the spongy substance inside bones that makes blood cells. When bone marrow expands, the bones become wider than normal. They may become brittle and break easily. An enlarged spleen. The spleen is organs that helps your body fight infection and remove unwanted material. When a person has thalasseamia, the spleen has to work very hard. As a result, the spleen becomes larger than normal. This makes anemia worse. If the spleen becomes too large, it must be removed. A complete blood count (CBC) - to measure hemoglobin levels, quantities of red blood cells and their size. Not only patients with thalasseamia have less hemoglobin than normal, their red blood cells may be particularly small. A reticulocyte count - this blood test measures how fast red blood cells (reticulocytes) are being made by the bone marrow and released into the blood. Reticulocytes are usually in the bloodstream for approximately two days before they develop into mature red blood cells. Between 1% to 2% of a healthy person's red blood cells are reticulocytes. Genetic testing - DNA analysis will help either diagnose thalasseamia or tell whether a person is carrying faulty hemoglobin genes. Prenatal testing for thalasseamia - to find out whether the fetus has thalasseamia and how severe it might be. The following tests may be done. Chorionic villus sampling - a piece of the placenta is taken out and checked in the laboratory. This is usually done at the end of the first trimester, around the 11th week of pregnancy. Amniocentesis - a sample of amniotic fluid is taken. This usually occurs during the 16th week of pregnancy. Amniotic fluid is a clear, slightly yellowish liquid that surrounds the fetus. Treatments for thalasseamia depend on the type and severity of the disorder. People who are carriers or who have alpha or beta thalasseamia trait have mild or no symptoms. They’ll likely need little or no treatment. Doctors use three standard treatments for moderate and severe forms of thalasseamia. These treatments include blood transfusions, iron chelation (ke-LAY-shun) therapy, and folic acid supplements. Other treatments have been developed or are being tested, but they're used much less often. Transfusions of red blood cells are the main treatment for people who have moderate or severe thalasseamia. This treatment gives you healthy red blood cells with normal hemoglobin. During a blood transfusion, a needle is used to insert an intravenous (IV) line into one of your blood vessels. Through this line, you receive healthy blood. The procedure usually takes 2 to 4 hours. Red blood cells live only for about 120 days. So, you may need repeated transfusions to maintain a healthy supply of red blood cells. If you have hemoglobin H disease or beta thalasseamia intermedia, you may need blood transfusions on occasion. For example, you may have transfusions when you have an infection or other illness, or when your anemia is severe enough to cause tiredness. If you have beta thalasseamia major (Cooley's anemia), you’ll likely need regular blood transfusions (often every 2 to 4 weeks). These transfusions will help you maintain normal hemoglobin and red blood cell levels. Blood transfusions allow you to feel better, enjoy normal activities, and live into adulthood. This treatment is lifesaving, but it's expensive and carries a risk of transmitting infections and viruses (for example, hepatitis). However, the risk is very low in the United States because of careful blood screening. After red blood cell transfusion patients are advised to take vitamin c which helps in removal of iron from body in urine. The hemoglobin in red blood cells is an iron-rich protein. Thus, regular blood transfusions can lead to a buildup of iron in the blood. This condition is called iron overload. It damages the liver, heart, and other parts of the body. To prevent this damage, doctor’s use iron chelation therapy to remove excess iron from the body. Two medicines are used for iron chelation therapy. Deferoxamine is a liquid medicine that's given slowly under the skin, usually with a small portable pump used overnight usually 8 to 12 hours. This therapy takes time and can be mildly painful. Side effects include problems with vision and hearing. Deferiprone.Given based on body weight of patients but causes body aches and pains. Folic acid is a B vitamin that helps build healthy red blood cells. Your doctor may recommend folic acid supplements in addition to treatment with blood transfusions and/or iron chelating therapy. It is given once a day. Other treatments for thalasseamia have been developed or are being tested, but they're used much less often Hydroxyurea which is anti cancerous drug is used in some centers like in Hamza foundation Peshawar Pakistan which in some patients decreases the frequency of blood transfusions. A blood and marrow stem cell transplant replaces faulty stem cells with healthy ones from another person (a donor usually sibling). Stem cells are the cells inside bone marrow that make red blood cells and other types of blood cells. A stem cell transplant is the only treatment that can cure thalasseamia. But only a small number of people who have severe thalasseamia are able to find a good donor match and have the risky procedure. Researchers are working to find new treatments for thalasseamia. For example, it might be possible someday to insert a normal hemoglobin gene into stem cells in bone marrow. This will allow people who have thalasseamia to make their own healthy red blood cells and hemoglobin. Researchers also are studying ways to trigger a person's ability to make fetal hemoglobin after birth. This type of hemoglobin is found in fetuses and newborns. After birth, the body switches to making adult hemoglobin. Making more fetal hemoglobin might make up for the lack of healthy adult hemoglobin. Better treatments now allow people who have moderate and severe thalasseamia to live longer. As a result, these people must cope with complications that occur over time. An important part of managing thalasseamia is treating complications. 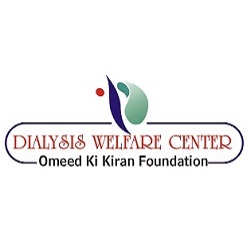 Treatment might be needed for heart or liver diseases, infections, osteoporosis, and other health problems. What are the complications of thalasseamia? Iron overload - this may be because of the frequent blood transfusions or the disease itself. Iron overload raises the risk of hepatitis (swollen liver), fibrosis (enlarged liver) and cirrhosis (liver becomes progressively damaged by scarring). The endocrine system includes glands that produce hormones. The pituitary gland is particularly sensitive to iron overload and can become damaged, which may lead to delayed puberty and restricted growth. Later on after puberty the patient may be at a higher risk of developing diabetes, and having either an underactive or overactive thyroid gland. Iron overload raises the risk of arrhythmias (abnormal heart rhythms) and congestive heart failure. Enlarged spleen (spleenomegaly) - also known as hypersplenism. The spleen recycles red blood cells. In patients with thalasseamia the red blood cells may have an abnormal shape, making it harder for the spleen to recycle them; the red blood cells accumulate in the spleen, making it grow. An enlarged spleen can become overactive - it starts destroying healthy blood cells the patient receives during transfusions. Sometimes the patient may need a Spleenectomy (surgical removal of the spleen). Infection - if the patient has had his/her spleen removed, there is a greater risk of infection. Bone deformities - in some cases the bone marrow expands, which deforms the bone around it. The bones of the skull and face may be affected. As the bone marrow expands, the bone around it becomes brittle, increasing the risk of fracture. What is the life expectancy for someone with thalasseamia? According to the American Academy of Family Physicians, a patient with thalasseamia trait has a normal life expectancy. Those with beta thalasseamia major, on average live 17 years and generally die before their thirtieth birthday. The majority of deaths are caused by the heart complications of iron overload. You can’t prevent thalasseamia because they’re inherited (passed from parents to children through genes). However, prenatal tests can detect these blood disorders before birth. Family genetic studies may help find out whether people have missing or altered hemoglobin genes that cause thalasseamia. If you are known carrier of thalassaemias and you're thinking of having children, consider talking with your doctor and a genetic counselor. They can help determine your risk for passing the disorder to your children. Living with thalasseamia can be challenging, but several approaches can help you cope. Following the treatment plan your doctor gives you is important. For example, get blood transfusions as your doctor recommends, and take your iron chelation medicine as prescribed. Iron chelation treatment can take time and be mildly painful. However, don't stop taking your medicine. The leading cause of death among people who have thalasseamia is heart disease caused by iron overload. Iron buildup can damage your heart, liver, and other organs. Several chelation treatments are now available, including injections and pills. Your doctor will talk with you about which treatment is best for you. Children who have thalasseamia should receive yearly checkups to monitor their growth and development. The checkups include a physical exam, including a height and weight check, and any necessary tests. If you or your child has Thalassaemia, you may have fear, anxiety, depression, or stress. Talk about how you feel with your health care team. Talking to a professional counselor also can help. If you’re very depressed, your doctor may recommend medicines or other treatments that can improve your quality of life. Joining a patient support group may help you adjust to living with thalasseamia. You can see how other people who have the same symptoms have coped with them. Talk with your doctor about local support groups or check with an area medical center. Support from family and friends also can help relieve stress and anxiety. Let your loved ones know how you feel and what they can do to help you. Some teens and young adults who have thalasseamia may have a hard time moving from pediatric care to adult care. Doctors and other health professionals who care for these children might not be familiar with adult issues related to the disorder, such as certain complications. Also, it might be hard for adults who have thalasseamia to find doctors who specialize in treating the disorder. Ask your child's doctor to help you find a doctor who can care for your child when the time comes to make the switch. Planning and good communication can help this move go smoothly.